Good morning to all my blog friends. I do apologise for my absence of late, it's been rather busy at our place, but lots of fun, well other than the gruesome monster with mega sharp knives that slice so delicately through tomato - lol. I haven't forgotten to come visit, I have missed keeping in touch with all the blog lovin' of late, and hope to be back 'regular like' this week. I will pop in and say hello to you all over the next few days and catch up with what you have been doing at your place. I so miss chatting to you all, and checking out your craftiness. This has been some of what has kept me busy the last few days, along with committee, family, parties, farewells, baking for farewells, and general Mum stuff. A collection of scraps. . . .
becomes a collection of little squares. . . .
with a little love and more yarn, becomes some snuggly squares to post to Mrs Twins to be made into blankets to keep others warm. 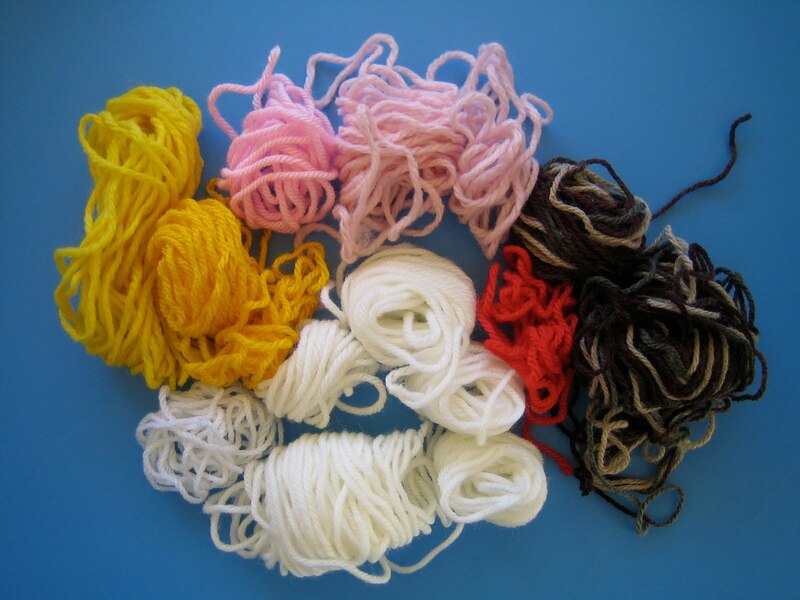 This is what I made from the above 'scraps' of yarn. The two little squares that are not complete, will be very soon to add to the collection to post over. I just need more yarn, which won't be far away, once I complete a few other projects. If you have 'scraps' of yarn and a little spare time, you can also make some squares to be made into rugs to help keep others warm. Pop over and have a look at all the stunning squares that are being made for rugs. Mine are rather 'plain jayne' compared to the talent that is showing up over there. So tell me, what's on YOUR table this Tuesday. I hope it's something fun. What a gorgeous selection of squares you have made! Well done to you for sharing your talent to this wonderful cause. I love all the colours, especially the white, yellow and pink combination. I am still trying to work out my favourite colour combo....but I do love the red one with pink centre "bit"- yes can you tell I have no idea re crochet!!! Awesome job! What a nice surprise I had when I opened up SIBOL. A post from Joyce! Thanks so much for your kind words and 'help'. Your Squares are just lovely. 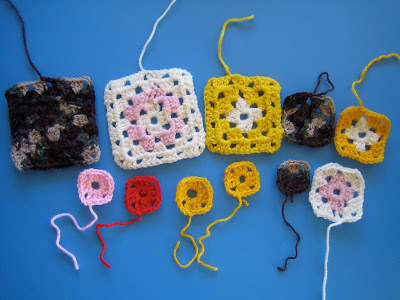 I have said many times how different Granny squares look with different coloured yarn, it's amazing how they transform! I appreciate your help very much Joyce and once again I'm pleased you are now a Member of our SIBOL TEAM! Hi Mrs Twins and Maria, Thanks so much, I had lots of fun, I could have chatted forever, lol, but thought I had better keep it sweet. Once you get me going. . . . . . .
Maria, so lovely to meet you, glad you introduced yourself, good to see another Aussie crocheting madly too. There seems to be a few of us now. Have a lovely weekend at your place. I am off here now to get a bit more done.